I was listening to a podcast from Soccer Wire about the upcoming changes to age groups and small-sided game format. You can listen to the episode from this link. It got me thinking about all of the questions we have about the process and how the state associations, leagues and clubs will handle it. I’m putting together a round table discussion on the changes with an Executive Director of a State Association, a league administrator, and club director and maybe one or two others. We’re going to record the discussion next week and should have it posted by the end of February. That will be just in time for the one year anniversary of the first episode of this podcast. This week’s training session might seem like a 180 degree turn from last week when I talked about developing creative players. But I followed that session up with the one I’ll share today and I think they complimented each other very well. 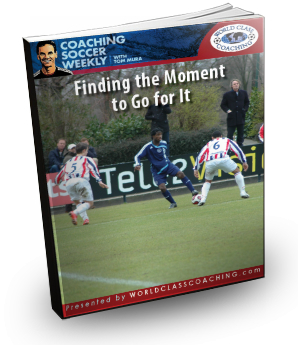 The focus is on teaching players to recognize the moments to go for it and also develop the patience to keep the ball until the moment arrives. I want players to go for it and create opportunities but deciding when to go for it and when to be patient in possession is difficult for players of any age. The best way to help your players learn to read situations and make decisions is by putting them in environments that replicate what they will be faced with in the game. Once they see an opportunity to go forward they also need the skills necessary to take advantage of it. This session begins by working on the passing, receiving and combination play skills they will need before putting the players in a small-sided game that’ll test and train their decision making ability. There’s a ball on every cone. When the ball goes out of play the player who touched it last must retrieve it. A player on the attacking team can take a ball from any cone and play from there immediately. These restarts create numbers up situations like the 3 v 2. This session is one that you will need to repeat or present in a different way a number of times before the players will internalize the technical and tactical concepts that you are teaching them. If you’re patient with them and remember to ‘coach’ not ‘criticize’ they will begin to see the pictures and make better and better decisions about when to go for it and when to keep possession and look for another opportunity. Next week I’ll share a training session that is focused on learning to protect the ball more effectively both individually and as a team.